Do you have an account with State Bank of India? Do you have the latest updates on the introduced services and facilities? SBI is indeed one of the leading banks in the Public banking sector of the country. It delivers unmatched banking services and advanced facilities across the globe. From time-to-time, SBI introduces different schemes and services to meet the growing requirements of convenient banking services. 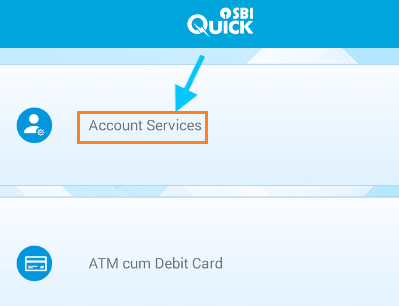 SBI Quick is one of the latest banking services introduced by the bank. With SBI Quick, you can access banking services by giving a missed call or sending an SMS to a dedicated number with specific keywords to avail the services. SBI Quick is a Smart Mobile App offering a wide range of services like balance enquiry, mini statement, ATM Card Usage configuration, Card Blocking, home/car loan inquiry, etc. The Smartphone users using iOS, Android, Windows or Blackberry handsets need to download the SBI Quick App from the respective play stores/App stores and get it installed on their handset. To access the services, the users need to register the mobile number in SBI account. After registration, you need not need an internet connection to access the services. The service enables over a missed call or SMS. Step 1: If you have an Android device, install the SBI quick app from Google play store. For other devices, visit their respective stores. 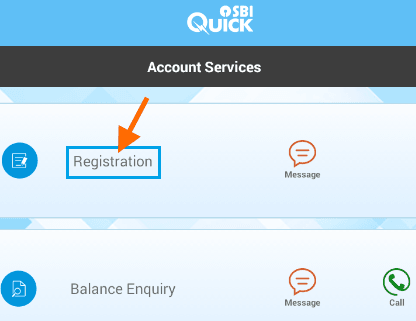 Step 2: Now open the app and click the 'Account Services' for registration. Step 3: Next click on the 'registration' tab. Step 4: Now enter the 11-digit account number and click the continue button. You will be registered for SBI quick missed call facility successfully. Now tap on related service that you have required, you will get info as well as SMS on your registered mobile number. You need to register your permanent mobile number once in the app to start accessing the services. Send an SMS with Code- 'REG' to 09223488888. Make sure to send the SMS from the registered mobile number provided at the bank during account opening. You will receive a confirmation message stating successful/unsuccessful registration for SBI Quick missed call service. Important Note: If you received the successful message, you could start using the services, but, if you received the unsuccessful message, you need to check the SMS format/code as well as the destination number. You must have the dedicated numbers for accessing missed call or SMS services. For Balance Inquiry the toll-free number is 09223766666, for mini-statement, the number is 09223866666, for ATM card using the number is 09223966666, and for loan inquiry, the dedicated number is 09223588888. You must gain maximum knowledge about the app and services before accessing the services. You need to send SMS with the right code to obtain the required results. You will get authentic information from the app. Send 'HELP' to 09223588888 to obtain the full list of services after registration. Make sure to check the applicable charges for sending SMS. You don't need to pay for accessing missed call services.